Albany, USA, 2018-Jan-17 — /EPR Network/ —A new insightful study based on concrete block and brick manufacturing titled “Concrete Block and Brick Manufacturing Market – Global Industry Analysis, Size, Share, Growth, Trends, and Forecast 2017 – 2027” has been submitted to the repository of Market Research Reports Search Engine (MRRSE). The report provides 360 degree view of the global concrete block and brick manufacturing market to its readers analyzing historical trends and forecasting future prospects from 2017 to 2027. According to the report, nearly 2769.24 Bn units of concrete block and bricks are expected to be generated by the global concrete block and brick manufacturing market by the end of 2027 with a robust CAGR of 3.8% during the forecast period from 2017 to 2027. The report begins with executive summary that provides market overview, market analysis and key information related to the market number such as CAGR and market share. 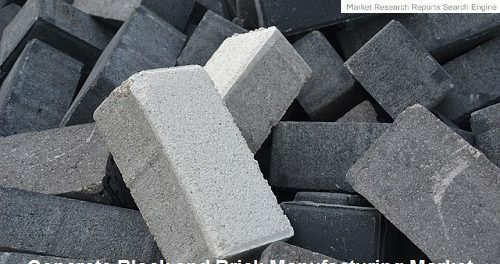 The next section provides market overview that provides basic details related to global concrete block and brick manufacturing market such as market definition, industry developments, key market indicators, market dynamics and analysis using methods such as Porter’s five force analysis, value chain analysis and SWOT analysis. In the market dynamic section, the study identifies factors driving and restraining the growth of the market. According to the report, the increasing urbanization and FDIs in construction & manufacturing sectors in Asia Pacific region are some of the major factors driving the growth of the global concrete block and brick manufacturing market. The detailed research report is divided into segments for in-depth analysis and these segments are product type and region. The product type segment is further sub-segmented into concrete blocks, brick and AAC. According to the report, the brick segment is estimated to lead the concrete block and brick manufacturing market with a 3.5% CAGR during the assessment period. Geographically, the concrete block and brick manufacturing market is divided into key regions that are North America, Latin America, Europe, Asia Pacific and Middle East & Africa. According to the report, the Asia Pacific region is estimated to lead the other regions and dominate the global concrete block and brick manufacturing market during the forecast period. The research methodology of the global concrete block and brick manufacturing market report offers key insights based on global as well as regional trends that will shape the market during the assessment period.